When KTRT, “The Root,” became official in 2008, Station Manager Don Ashford was was running the entire operation out of the barn behind his house in Mazama. It functioned in this way for years, but as the station grew, it became clear that more space and a more convenient location were needed. Six years later, KTRT began the move to the TwispWorks campus after receiving enthusiastic community support. Don’s first foray into radio was sort of by accident. 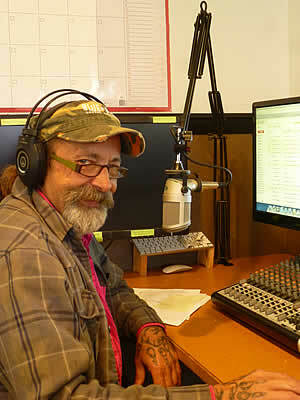 His friend, “Cowboy George,” was going out of town and needed someone to cover his morning show on KVLR. During that time, Don honed his skills and when Cowboy George left the radio for good, Don was asked to take his place.Now, Don runs his own station and offers the valley a wide, eclectic range of music that is chosen to reflect the mood of the time of day. Throughout the day, KTRT plays more upbeat tunes but slows down right before dinner time. I like to focus more on what kind of music is appropriate for the time of day instead of structuring the playlist around specific genres. The wide range of music knowledge at KTRT is augmented by 17 guest DJs, who have a wide breadth of musical interests ranging from speed metal to loungy jazz. For the future, Don is contemplating how best to get shows available on the web. Check out the KTRT website!